Maybe you’ve got a mop, a stick vac, a Swiffer, and a WetJet. But maybe you need to add a steam mop to that collection! Before you plunk down cash and work to find storage space for yet one more cleaning machine, check out Consumer Reports’ latest steam mop tests. 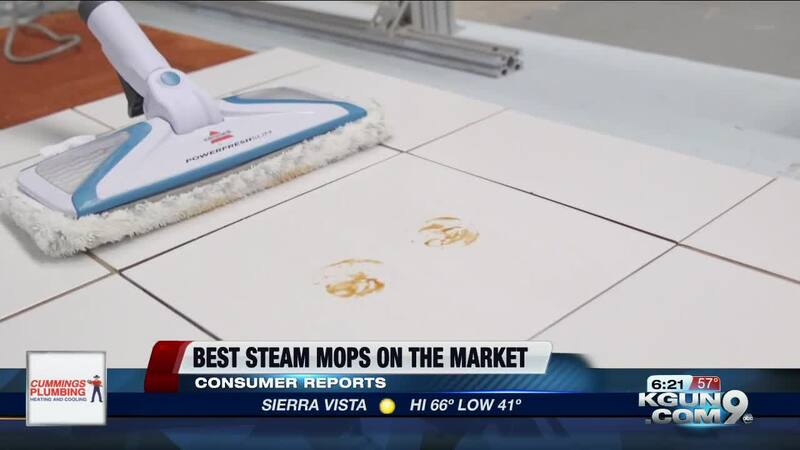 TUCSON, Ariz. - Steam mops claim to clean tough stains and sanitize. “Steam mops seem like they’d be a more convenient option because you don’t have to get a water bucket out, you don’t have to drag the mop back and forth to clean it and that steam really seems like it would be tough on grime," says Consumer Reports Home Editor, Haniya Rae. To see how well each mop can clean up messes testers applied jam, mustard and ketchup to floor tiles. Each tile gets the same amount, in the same spot. Then, a specially designed device allows testers to step back and watch the machines go to work. To keep it fair, each mop makes ten strokes back and forth for a total of 20 passes. The tests are actually designed to leave behind some of the mess. “If the mops cleaned up all of the stains we wouldn’t be able to detect cleaning performance differences between the mops therefore we take a photo before and after each test," says Rae. Then, testers use photo imaging software to measure the change in the image before and after cleaning. The difference is then converted into a score. The results: Just because there’s steam doesn’t mean all of the mops can clean. With this $80 Shark Steam Pocket you have to keep the mop moving back and forth to pump steam to the mop head, something CR testers found annoying. The Bissell PowerFresh Slim for $130 out-cleaned the other mops. For slightly less cleaning performance, Consumer Reports recommends the $100 Shark Genius. It offers convenient cord storage. You can also flip it over to spray steam directly on a stain and use both sides of the mop. If tough stain scrubbing is your goal, the $90 Bissell PowerFresh Deluxe comes with an extra brush for deeper scrubbing and very good cleaning power. If you’re still on the fence about whether a steam mop is the way to go, know this: All of the steam mops Consumer Reports tested require distilled water. And all of them left residual moisture behind, which is a no-no for hardwood and laminate floors. For more details on choosing a steam mom, and to learn more about some of their features, click here.